An IEBC official inspects materials for the repeat presidential election on October 24, 2017. "Conducting six elections in one day resulted in fatigue among electoral officials. Some of the errors witnessed were as a result of the fatigue," the report says. The commission also wants MPs to change the Constitution to realign the term of county assemblies with that of the other elective seats "for legal clarity". The law says that the term of a ward representative is five years -- a clause that resulted in the confusion witnessed when the County Assemblies Forum demanded that members be paid for the "remainder" of their term after the August 8, 2017 election. "Ideally, commissioners should be in office for the entire electoral cycle, and where not possible, at least two years to the General Election. There is need to consider staggering the appointments so that the term of the entire commission does not end on the same date," the report adds. IEBC uses its case in 2017 when the presidential election results were nullified -- the first on the continent and only the fourth in the world. The commission disputes the narrative that the Raila Odinga-led National Super Alliance was denied access to the electoral server, with its logs showing that at 34, the coalition had four more log-ins than all the other parties' representatives combined. Jubilee's Davis Chirchir is shown to have logged in 10 times, with Mr Collins Ndindi, an independent candidate agent, logging in six times as compared to the three, six, and five log-ins by Mr Japheth Kaluyu's agent, the United Democratic Party and the Thirdway Alliance respectively. "Access was provided to Nasa and Jubilee agents, though for a shorter period of time than anticipated. At no time did the commission deliberately prevent access to the server. "Indeed, once a secure connection was established, the server continued to be available and accessible until mid-October 2017 when it was redirected for use in the presidential rerun," the report adds. This, the commission added, was rejected by Nasa which demanded live, real time access of the server, with a read-only capability -- a process "that required much longer than the 48 hours given by the court". "The design of the system required the commission to create special user accounts with permission and user rights to allow for log-in and download of the system logs. 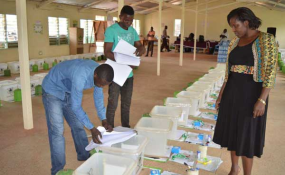 "The process of granting secured access was longer than anticipated since it involved collaboration with ICT experts outside the country," the IEBC says in a 249-page report that seems to deflect blame to other players in the electoral cycle. "It should include transport of ballot boxes and storage as it varies from one court to another," the commission says. The report also recommends funding throughout the electoral cycle "as disbursement of bulk funding in the last year of the electoral cycle does not do justice to planning".